Andreas Makris was born on March 7, 1930 in Salonika, Greece. He studied violin at Greece’s National Conservatory, and moved to the U.S. in 1950, where he continued his studies at Phillips University in Enid, Oklahoma. He also studied at the Kansas City Conservatory in Missouri and the Mannes College of Music in New York, graduating in 1956. His additional training was at the Aspen Music Festival and the Fountainbleau School in France, where he studied composition with Nadia Boulanger. Makris played violin with the Dallas Symphony, the St. Louis Symphony, and the National Symphony Orchestra, where he stayed until his retirement for 28 years, collaborating with NSO’s music directors Howard Mitchell, Antal Dorati, Mstislav Rostropovich and Leonard Slatkin. During his time at NSO, many of his compositions were performed by the orchestra, and in 1970 Andreas Makris became the first contemporary composer to have his work premiered at the Kennedy Center. 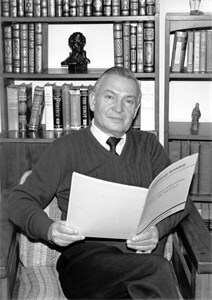 He served as NSO’s Composer in Residence from 1979 to 1989. He also received several grants and awards for his compositions, including a National Endowment for the Arts grant and an ASCAP Award. Upon his retirement from the NSO, Makris rededicated himself to composing. His total legacy consisted of nearly one hundred original compositions and arrangements.